News media and websites linked to the Catholic church in Spain and at the Vatican have lashed out at the LGBT community and supporters in the regional community of Madrid, following the announcement by Madrid-based LGBT rights group Arcópoli that it will seek enforcement of Madrid’s new anti-homophobia law by demanding a halt to public funding of a Catholic school whose director sent a letter to parents referring to homosexuality as unnatural and comparing the new law against homphobia in the Madrid region to Islamic terrorism. The wave of online articles has hit a crescendo over the past two weeks, with scores of religious news websites with names such as Religion en Libertad, InfoCatolica and Infovaticana following the lead of Spanish pro-church newspaper La Gaceta in attacking Madrid’s LGBT community and the regional Madrid parliament’s unanimous approval in July of the new legislation. 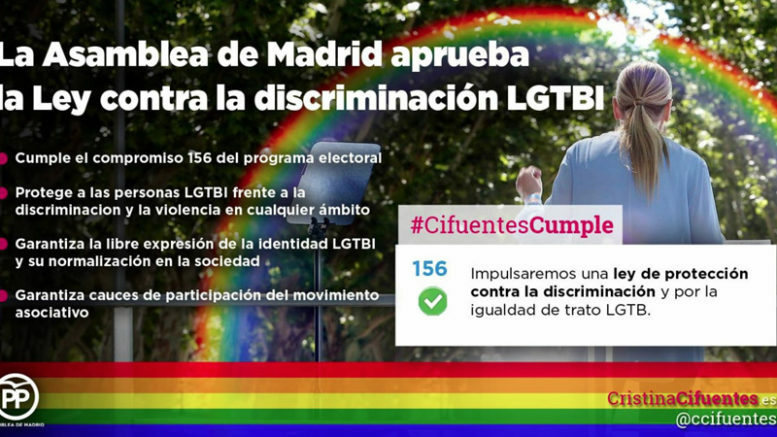 The law, which was shepherded through through the Madrid regional assembly in compliance with a campaign pledge by regional President Cristina Cifuentes of the conservative Partido Popular (PP), which governs the Madrid region and is a traditional ally of the Catholic church in Spain, expressly prohibits and provides sanctions against discrimination on the basis of sexual orientation or identity, while mandating sexual-diversity education at publicly funded schools throughout the Madrid region. The thrust of the backlash in the pro-church media is condemnation of the law and the effort to restrict funding for the Catholic school on the basis of discrimination, decrying what it calls Spain’s “LGBT lobby” that it says is behind the legislation and is forcing its “ideology” onto parents and children at Catholic schools, which in Spain continue to receive public subsidies under agreements with local and regional governments.